A Professional Practice Chair, Faculty of Biochemistry, National University of Tucumán, Argentine. B Endocrinology Service, Hospital of Child Jesus, Tucumán, Argentine. Obesity is a metabolic and inflammatory disease that has become an epidemic, not only in adults but also in children and adolescents. Obesity prevalence has increased in recent decades and it is considered the most common chronic non-communicable disease in the world1. Childhood obesity often continues into adulthood and is closely associated with insulin resis tance (IR), dyslipidemia, high blood pressure, and type 2 diabetes2. Several processes are involved in the association between obesity and inflammation, including adi pocyte hypertrophy and hyperplasia, macrophage recruitment, increased hypoxia, increased oxidative stress, and increased secretion of inflammatory cytoki nes such as Tumor Necrosis Factor a (TNF-Α), Inter leukin 6 (IL-6), and Monocyte Chemoattractant Pro tein-1 (MCP-1) (3,4. Cytokines have a profound effect on insulin sensitivity in the liver, peripheral tissues, and vascular endothelial homeostasis5. However, as in many pathophysiological situa tions, childhood obesity has its own characteristics that would include the synthesis and secretion of adipokines. Thus, childhood and adolescence are pe riods of intense adipogenesis and the accumulation of fatty tissue would be associated mainly with the increase in the number of normal-sized adipocytes (hyperplastic obesity). In addition, the adipokines secretion pattern would depend on the size of the adipocytes6,7. TNF-Α, produced by adipose tissue, macrophages, and endothelial cells, participates in several physiological processes in response to injuries, infections, an giogenesis and/or apoptosis. The TNF-Α has an important role in insulin resistance since it inhibits the action of insulin in adipocytes through insulin signaling pathway inhibitors and also appears to be related to peripheral insulin resistance8. It also has a damaging effect on vascular homeostasis, through different me chanisms such as the reduction of vasodilatation due to lower bioavailability of nitric oxide (NO), stimula tion of adhesion molecules expression in endothelial and smooth muscle cells, and increased apoptosis of endothelial cells10. IL-6, also a pleiotropic cytokine, is produced by numerous cells of the immune system, omental and subcutaneous adipose tissue. IL-6 levels are related to body mass index (BMI) and IR. IL-6 is the main re gulator of the acute inflammatory response and plays a critical role in chronic inflammation by stimulating the synthesis of C-reactive protein (CRP) (11,12. Mild elevations of CRP can occur chronically, providing a relatively stable indicator of low-grade inflammation over months or years13,14. Several stu dies showed that BMI and body fat distribution have a strong influence on serum CRP levels15,16. MCP-1 and its receptors are crucial in the deve lopment of the inflammatory response and in the recruitment of immune cells to sites of inflammation. Elevated levels of MCP-1 have been associated with atherosclerosis and vascular complications related to obesity17. On the other hand, the glycoprotein CD40, a ligand member of the TNFs superfamily (CD40L), binds to its specific CD40 receptor on the surface of cells. Both the CD40L and its receptor are expressed in platelets, lymphocytes and a wide variety of cells. The CD40L/CD40 system is involved in the pathophysiolo gy of chronic inflammatory diseases including atherosclerosis and thrombosis18,19. Research studies of these molecules in obese Latin American children are limited and the global role of these pathways poorly understood20. Therefore, the objectives of this study are to investigate the presen ce of a pro-inflammatory state, through the determi nation of TNF-Α, IL-6, MCP-1, sCD40L and us-CRP serum levels, and to analyze the correlation of these molecules with anthropometric and metabolic varia bles in a population of obese children. This observational, analytical and cross-sectional study included 37 children aged 8 to 12 years (18 boys/19 girls) who had consulted the Endocrinology Department of the Hospital del Niño Jesús in Tucuman, Argentina during the period 2013-2015 due to either overweight or obesity. A group of 20 healthy individuals (ten boys/ten girls) of similar gender and age, eutrophics, from a public school in this city were used as a control. Children from both groups who, at the time of the study, had infectious, inflammatory and endocrine diseases, and were in anti-inflammatory treatment were excluded. A conventional serum CRP value higher than or equal to 6 mg/L was used to rule out acute inflammation. This study was conducted with the approval of the National University of Tucuman, School of Medicine Bioethics Committee, and the signing of the patient informed consent form by the parents and/or patients guardians. Anamnesis was collected from each patient, con sidering age, weight, height, BMI, waist circumferen ce (WC), Tanner stages, and disease family history. Weight was measured with a beam-balance scale, light clothing, and no shoes. Height was measured with a stadiometer without shoes heels together, relaxed shouldersand, both arms at the sides of the body. BMI was calculated using the Quetelet index (weight/ height2). Normal weight was defined as BMI between 15 and 84 percentile; overweight between 85 and 97 percentile, and obesity > 97 percentile for age and gender. Percentiles were calculated using the reference tables recommended by the World Health Organiza tion in 200721. WC was measured at navel level, with a non-distensible tape measure. Abdominal obesity was considered with a WC > at 90 percentile for age and gender, according to percentile table from Fernandez et al22. Pubertal stage of children and adolescents was de termined by the endocrinologist, according to primary and secondary sexual characteristics under Tanner standards. Children with stage Tanner 1 were consi dered prepubertal and those with Tanner 2 to 5 were considered pubertal23,24. The presence of obesity, diabetes and/or cardio vascular disease family history was also checked in the anamnesis interview conducted with patient’s parents or guardians. After a 12-hour fast, a blood sample was obtained and the serum was analyzed for TNF-, IL-6, MCP-1 (ELISA method, R&D Systems, USA), sCD40L (ELI SA method, PeproTech, USA), ultra-sensitive CRP, (us-CRP chemiluminescence method, Immunolite 2000, Siemens), fasting blood glucose (colorime tric method, Wiener Lab, Argentina), plasma insulin (ECLIA method, Roche), and lipid profile (colorime tric method, Wiener Lab, Argentina). The HOMA index was calculated using the Matthews formula and HOMA-I, > 90 percentile was considered IR, according to gender and Tanner stage, using the percentile table from García Cuartero25. Data were analyzed using SPSS 20 software. The Kolmogorov-Smirnov test was used to determine the distribution of quantitative variables. The Mann- Whitney and Chi-square tests were used to compare groups and the Spearman coefficient to investigate the correlations between the variables. Data were expres sed as median and interquartile range, and a value of p < 0.05 was considered significant. Table 1 shows the clinical and metabolic charac teristics of the studied children. Obese children had significantly higher BMI, WC, insulin, HOMA, and triglyceride values than the control group. However, no differences were found in blood glucose, total cho lesterol, HDL, and LDL cholesterol levels. Abdominal obesity was present in 100% of obese children. Table 1 Clinic and metabolic characteristics od the groups studied. The analysis of family history of the studied chil dren showed that 71% (n = 26) had a history of obe sity, diabetes and high blood pressure, being diabetes the most frequent disease, regardless presence/absence of concomitant obesity or high blood pressure (51%, n = 19). Obese children had significantly higher values of TNF-a, IL-6, MCP-1, sCD40L, and us-CRP than their control pairs with normal weight (Table 2). No gender differences were observed in these analysis. Similarly, these molecules presented no differences between pre pubertal and pubertal children. Table 2 Levels of proinflammatory molecules in obese and controls. Interestingly, we found that 67% (n=25) of obese children presented IR. When comparing obese chil dren with and without IR, there was no difference in proinflammatory molecules concentration. 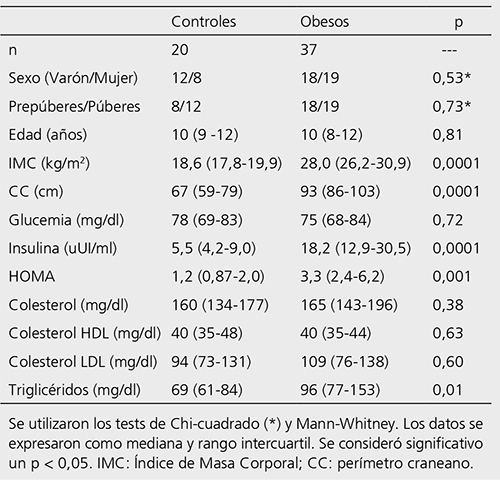 Both BMI and WC were positively correlated with the variables MCP-1, sCD40L, insulin and HOMA in dex (Table 3). Table 3 Correlations between the variables studied. The role of chronic low-grade inflammation as a link between obesity and its cardiovascular conse quences has been convincingly demonstrated in recent years26. Research in obese children and adolescents has shown vascular abnormalities such as decreased peri pheral vascular reactivity, increased carotid artery intima-media thickness, and elevated levels of adhesion molecules27,28,29. In this study, serum levels of proinflammatory mo lecules in obese children and adolescents were investigated . The results showed that obese infant-juvenile population had significantly higher values of TNF-Α, IL-6, and us-CRP compared to the control group, coincidentally with previous reports in the same kind of patients30,31. Different mechanisms could explain these results, for example, TNF-Α and IL-6 promo te lipolysis and the release of free fatty acids, contri buting to increased liver glucose production and IR. Both cytokines also cause adipocyte differentiation and promote inflammation, not only in adipose tissue but also in endothelial and hepatic cells, stimulating the synthesis of CRP32. Likewise , the high MCP-1 values found in this study are consistent with those reported by other researchers20,33. MCP-1 has been studied in relation to inflammatory diseases such as diabetes and obesity. Accordingly , visceral and subcutaneous adipose tis sue in obese patients presented an over-expression of MCP-1 gene compared with thin control patients34. Furthermore, MCP-1 expression was higher in omen tal fat than in subcutaneous fat in patients with severe obesity35. In addition, we have found higher levels of sCD40L in obese children, compared to control pa tients. The literature reports high values of this mole cule in adults with acute coronary syndrome, hyper cholesterolemia, diabetes and obesity36,37, as well as in children with hypercholesterolemia and type 1 diabetes38,39. However, research on this association in obese children is sparse and discordant. Byun et al found lower values of sCD40L in obese people compared to control patients, as opposed to our study(40). Further study would be necessary to explain these differences. Noteworthily, our correlation analysis indicates that obesity is associated with subclinical inflammation and IR. The current study has some limitations, mainly considering that the cross-sectional design only allows for association, but not causality. The sample size is relatively small, and some results did not reach the verge of statistical significance, such as the difference between gender and pubertal development. Therefore, studies in a larger population are needed for further research. In conclusion, elevated serum levels of TNF-Α, IL- 6, MCP-1, sCD40L, and us-CRP suggest the presence of a pro-inflammatory state in the studied population. These data provide preliminary results for Argentinean obese children, which should be confirmed with fur ther research studies. Early assessment of these mole cules is important in order to implement appropriate therapeutic approaches to prevent cardiovascular risk factors during childhood. Acknowledgments: To Wiener-Lab for the donation of some reagents used in carrying out this work. This study was support in part by a grant of Research Council of National Uni versity of Tucumán. Correspondence: Adela Victoria Abregú avabregu@gmail.com.